Services and Parts | Frontier Equipment Co.
Frontier Laundry Equipment Xperts supports your business long after you have purchased your dry cleaning and commercial laundry equipment. We have years of experience serving South Carolina’s laundry and garment care industry. So, when it comes to installation, maintenance, and replacement parts, we’ve got you covered! When you invest in the best dry cleaning and commercial laundry equipment, you want to ensure that it is installed and programmed perfectly, for maximum efficiency and performance. Frontier’s expert technicians have years of experience in dry cleaning and commercial laundry equipment installation. We’ll show you how to use and program your new equipment for maximum performance. We’ll also advise you on the best maintenance practises so you can continue to benefit from your investment for years to come. Prevention is better than cure. At Frontier, we proudly stand behind our dry cleaning and commercial laundry equipment. Our equipment is built for high performance and long life. Our expert technicians will keep your dry cleaning and commercial laundry equipment working in tip-top shape. Contact us about our maintenance services and we’ll keep your investment working for your business for decades to come. At Frontier, we have the expertise to diagnose your problem, and our expert technicians can get your equipment working as good as new. When you need a replacement part for a dry cleaning or commercial laundry machine, you need a solution as quick as possible and at the right price. At Frontier, we have a large selection of authentic replacement parts to keep your laundry equipment working at its best, so you can get on with running a successful business safe in the knowledge that we’ve got you covered. 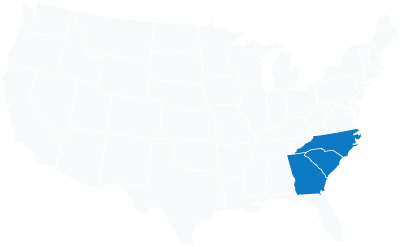 We proudly serve businesses across the South Carolina, North Carolina, & Georgia.